We will personally design the program based on your unique test results and work with you one-on-one through the internet. You’ll still get plenty of face time with me and my staff of health practitioners. Between one-on-one consultations, we will “meet” through virtual office hours, where we have lively, fun Q&As, and you become a member of our Private Face Book Group. Interested? Good! Click to expand and learn more about each step in the process. You will receive a requisition in your inbox to print out and take with you to a Quest Diagnostics Lab or LabCorp in your city. 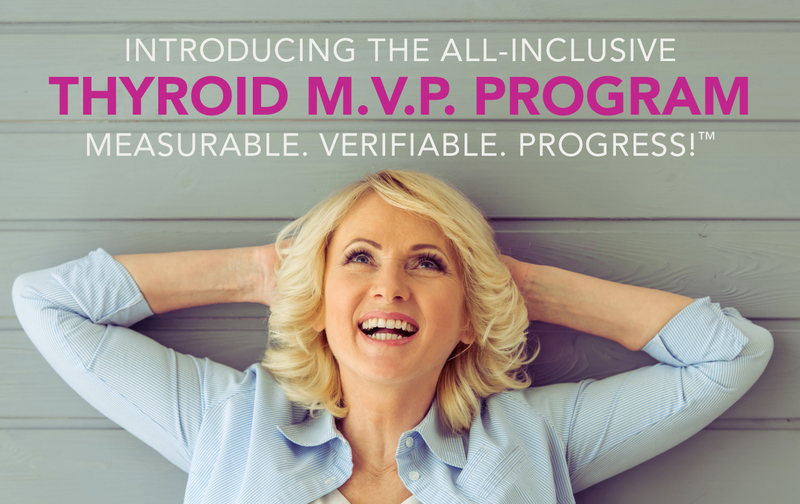 Click here to view a list of tests included in our Thyroid MVP Program. This comprehensive test will help us identify whether or not you have Hashimoto’s, hypothyroid, anemia, a low-grade chronic infection, fatty liver, high cholesterol, glucose issues, vitamin and mineral deficiencies, and/or inflammation markers. A second comprehensive lab panel requisition is included. We will order this test in three to four months so we can compare results. Once your blood test is processed, you’ll receive an easy-to-understand comprehensive report that explains the lab results. That information will be reviewed in your consultation. You will be talking with Dr. Labbe (one-on-one) approximately every 4 to 5 weeks for the equivalent of three consultation hours. Every other week you will be “meeting” on a group call called Tuesday Thyroid Tap , where you will find comrades and deep dive with like-minded people on thyroid related subjects like tachycardia, hair loss, low libidio, brain fog, weight gain, digestive issues, how to overcome infections, and balance Hashimoto’s. Based on your blood work, we will design a comprehensive healing diet and lifestyle plan for you. We will also use the results of your blood work to make personalized recommendations on supplements that can help replenish your body. With our many contacts in the nutritional world, we can almost always offer you big discounts on your supplements. You will automatically become a member of Tuesday Thyroid Tap™ giving you access to our group virtual office hours and our live Q&A sessions. This is a great way to keep in touch with us between our one-on-one consultations. You are not alone in your struggle! Meet a community of like-minded women who want to hear your story and share your challenges and wins. Later, if you so choose, you can mentor others based on your experiences. Finally, you’ll get an autographed copy of my Amazon #1 bestseller: Thyroid & Menopause Madness. Why It Feels Like You’re Falling Apart and What You Can Do About it. We will help you regain your strength, passion, and sense of well- being. I know I can help you, because I have helped hundreds of hypothyroid and hormone-challenged women just like you! There is no “silver bullet” to magically balance your thyroid and hormones. I’m here to share with you highly effective, cutting edge, scientifically proven strategies and techniques that have been used by hundreds of wonderful clients of mine across the country. Based on my own personal need to live big, I have created protocols based on years of clinical practice and the research of the top thought leaders in the field of functional neurology, endocrinology, and nutrition. It is my passion to coach, inspire, and educate women struggling with hormones, hypothyroid, and Hashimoto’s, and to discover the root cause of the “why” of those issues. Are you ready to finally understand, to get clarity, and get moving toward the life you thought you had lost? It may not be exciting, but it is true. Small differences over time create a big difference! That’s what I am here to help you do. If you are ready to finally say “enough” to struggling with fatigue, indecision, a life of feeling invisible, then I will give you the tools and the EXACT process I have used to take myself and many others from unclear, frustrated, brain fog, and weight havoc, to living a fulfilled balanced life. Frankly, it won’t always be easy. You have to be ready to do the work; to give me your focus, willingness, and an open spirit. If you are ready to commit to that, I’m ready to commit to you and your success. My Thyroid M.V.P. Program will give you access to everything you need to break free and live your extraordinary life. If you accept the tools I give you, take action, and follow through, I am 100% certain you will transform your health!